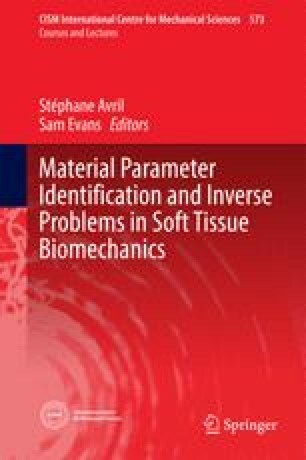 In this chapter, we are interested in the constitutive equations used to model macroscopically the mechanical function of soft tissues. After reviewing some basics about nonlinear finite strain constitutive relations, we present recent developments of experimental biomechanics and inverse methods aimed at quantifying constitutive parameters of soft tissues. A focus is given to in vitro characterization of hyperelastic parameters based on full-field data that can be collected with digital image correlation systems during the experimental tests. The specific use of these data for membrane-like tissues is first illustrated through the example of bulge inflation tests carried out onto pieces of aortic aneurysms. Then an inverse method, based on the principle of virtual power, is introduced to estimate regional variations of material parameters for more general applications. The author of this chapter would like to thank all the students and colleagues who participated to cited studies: Aaron Romo, Pierre Badel, Frances Davies, Ambroise Duprey, Jean-Pierre Favre, Olfa Trabelsi, Yuanming Luo, Jia Lu, Matt Bersi, Chiara Bellini, Katia Genovese, Jay Humphrey.